Katie’s friend, Kim, from Ohio arrived yesterday night and will be staying with us for the week. She and Katie left this morning for Schlitterbahn water park and San Antonio. They’ll return tomorrow after staying over night in San Antonio. Kathy and I went grocery shopping today and bought piles of stuff assuming that the youngsters will eat us out of house and home upon their return. 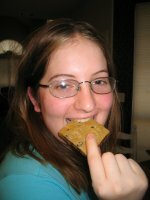 Katie wanted chocolate chip cookies today. We didn’t have any walnuts so first we had to buy some. We had all the other ingredients. After we returned from the store we made a double-batch. 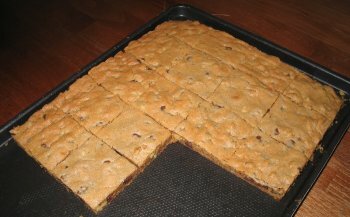 We were lazy so we made them into chocolate-chip-bars on a cookie sheet instead of individual cookies. After they cooled down I trimmed and cut them with a circular pizza cutter. I was slow in taking the picture and we had already eaten the edge trimmings and a bunch of the bars. If I took another picture now it would show an empty pan. Yum. We can’t do this every week, but it was fun today. Yesterday Kathy and I had made chocolate-covered strawberries for today. Kathy was having a group of stitching friends over and she wanted a treat for them. 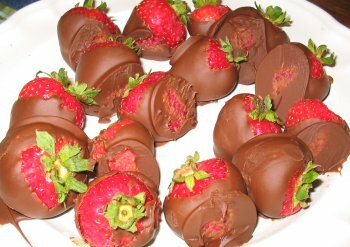 We used fresh ripe strawberries, and Hersey’s chocolate. Well we made too many, and now I have the unenvious responsibility of getting rid of them. Yum! This is just one of several plates of them. Awwww, that’s just too bad. I’ve eaten so many today that I’ll probably not get to sleep tonight. Hmmmm. But there something special about the combination of flavors – the tart strawberries and the sweet chocolate – the combination is more than the sum of its parts. Yesterday was running and recovery along with a bit of work. I fixed a thorny problem which felt good. During my unit testing at the end of this week I encountered a problem and since then I have been working on trying to fix. This problem was known and had been discussed earlier by the smart people on my team, but was not considered a significant problem. Well now that my unit testing had exposed it, I felt it was indeed a problem that needed to be solved. So after much thought and study, and with a few lines of carefully placed SPU assembler code here and there I got it working. Now the unit test is passing which is good. Naturally there is always more to do, but doing this change entirely by myself and fully understanding what I did further helps reduce the pressure that I have placed upon myself to contribute to this effort and become a full member of it. So today I didn’t have anything pressing to do. Kathy asked if I wanted to make some shelves for her quilting room, which was once Matthew’s bedroom. I said sure. We talked about what she wanted. I sketched up some plans, and estimated that it would cost about $125. We drove over to Home Depot together and bought the materials: two 4 by 8 foot sheets of birch veneered plywood cut into eight 8 foot by 12 inch wide pieces (they were kind enough to cut them there for us); four mounting strips, and twenty-eight shelf brackets. After getting home I got out the tools in the garage while Kathy cleared out the closet upstairs. Afterwards she came down and helped me. Psst, have I ever told you that she hates me taking pictures of her, especially when she’s got her eye and ear protection on, well she does. Together we cut the shelves to length, routed the edges with a curved bit, and sanded the edges. Next we carried the materials and some tools up to the room. First we removed the rod, then we measured and mounted the strips to the closet wall, inserted the brackets, and layed down the shelves. As we were doing it we realized we had over bought one strip and 10 shelf brackets, so we plan on returning the brackets, but since we had already cut the extra strip we can’t return it. Although I had a few difficulties getting the screws into the corners of wall with the screw-gun, in the end I was able to do it. After the project was all done the shelves were ready to get filled with boxes of quilting and craft materials. And that makes my sweetheart happy which in turn makes me happy. 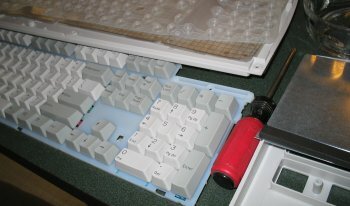 You are currently browsing the Watt's Up blog archives for August, 2006.